with a noticeable drop in efficiency. Very soon after we came to the Netherlands I bought a fairly well used second hand town bike for getting about in the city. This bike had a seven speed Shimano Nexus hub gear. It's really a very nice gearing system, but I've never been entirely happy with the inherent inefficiency of multi-speed hubs. After a couple of years it developed some problems and I "upgraded" to a three speed Sturmey Archer gear. Sturmey Archer three speeds are far more efficient than hub gears which have a greater number of gears. This is especially so in the middle gear which is a direct gear like a single speed bike. I set the gearing ratio so that I almost always used this middle gear. Sturmey Archer three speeds are extremely reliable, but this part was more than 30 years old and came with an unknown history. When it started eating its internals about a year ago I had to find something else quickly. My daughters both ride traditional Dutch single-speed sit up and beg bikes with back-pedal brakes. A couple of years ago, one of my daughters broke several spokes in the rear wheel when a friend jumped onto the back of her bike and I fitted a new wheel for her. It was her broken rear wheel that caught my eye when I was in a hurry to fix my bike - I quickly rebuilt the wheel and used it to replace the three speed. The shifter and brake lever stayed on the handlebars of my bike as this was to be a temporary measure. inch chain for single speed use. A year later I found I was still riding single-speed with no particular desire to change. When it became obvious a couple of weeks ago that the chain and other parts of the transmission were far too tired to continue, I decided to make the shift to single-speed permanent. There were also several other parts which needed changing due to wear so I collected together all the parts and changed them this week. A worn 36 tooth front chainring was replaced by a new 38 tooth chainring, a new 16 tooth sprocket was fitted on the back and a specially designed single speed 3/32nd chain from KMC linked these two together. The existing chaincase just needed a clean before it could protect the other new parts. A new pair of my favourite flat pedals. The pedals were also extremely worn. In many thousands of kilometres of riding, not only had the plastic parts won completely flat but I'd also worn right through the metalwork of one of the pedals to the extent that it was letting rainwater into the ball bearings. The old pedals still worked very well, but I replaced them anyway with an identical set of my favourite type of flat pedal. At this point I also finally removed the extra brake lever and the gear lever which I've not been using for the last year and replaced my old bell with a type which is built into the handlebar grip. As a result, my handlebars are now very uncluttered. The bike is now very simple and it's somewhat lighter than it was too. It rides really nicely with almost no noise at all. A 38 tooth front chainring and 16 teeth at the back result in a gear ratio of around 64 inches. This is calculated as 38/16*27 inch approximate wheel diameter. It's equivalent to about 5.1 metres development (64 * pi / 39). This means that a cadence between 70 and 80 revolutions per minute results in a cruising speed between 20 and 25 km/h: a reasonable speed in town. The old bike is rideable again. Just one gear now, but having adjusted the size of the rear sprocket and the chainring it's the right gear for me. That's important. This is an efficient and practical bicycle for everyday use, optimised for me. 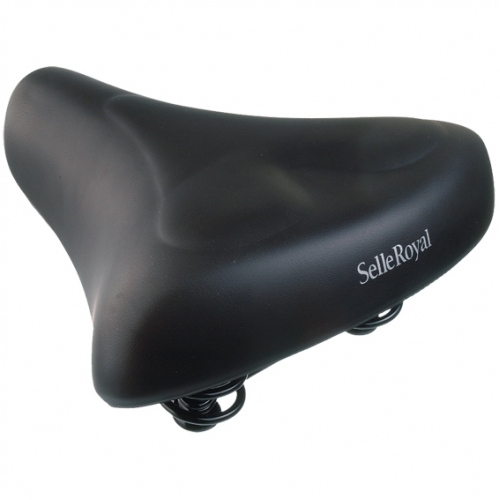 The saddle looks slightly sad, but it's still got some life in it. I recommend always having a front brake on any single speed bike even if your local laws allow doing otherwise. My front wheel is unchanged from when I bought the bike and includes a Shimano roller-brake. Sturmey Archer hub brakes are perhaps a better choice due to having no drag at all when not in use. 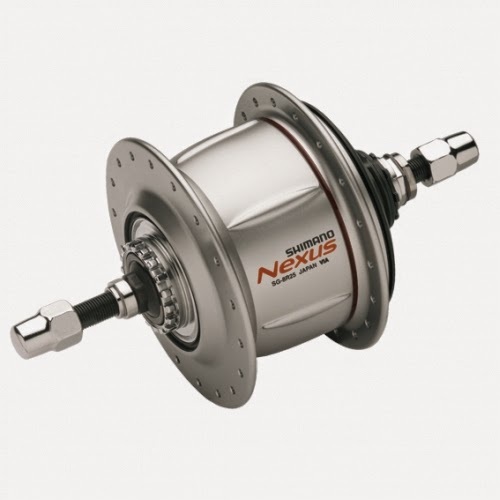 Due to the workings being entirely enclosed, hub brakes like these have a huge advantage in reliability over both brakes which operate on the rim and also disk brakes. In six years and many thousands of kilometres of riding in all weathers, I've not even had to adjust the cable on this front brake. My bike also has a B&M front light running from a Nordlicht dynamo, a very comfortable saddle, North-Road handlebars (IMO the most comfortable handlebars for upright bikes) and a bell built into the left handlebar grip. It's even fitted with coat guards, which again have no influence whatsoever on the performance of the bike, but reduce the chance of long coats being caught in the wheels. The permanently mounted lock means I can leave it anywhere while the anonymous appearance makes it more likely that it'll be where I left it when I come back - a good thing for a bike which is often to be parked in the city. Why call it "a near fixie" ? Why do I refer to the bike I have now as a "near fixie" ? It divides the line between what people think of as a heavy utility bike and what is thought of as a light fixed wheel bike. My old Holdsworth fixie. Built in 1948.
new owner is still enjoying it. I used to have a fixed wheel bike, but I sold it eight years ago before we emigrated. My fixie had an 82 inch gear making it suitable for riding quickly through the countryside, but that wasn't suitable for collecting shopping in the town. It was nice, but for longer rides I had a faster and more comfortable bike so the fixie didn't get much use. as they offer a choice of SPD or flat. The attractive thing about fixies is the feeling of efficiency. Each turn of the pedals pushes you forwards. There's nothing "in the way". They're also very light. However, the downside with most fixies is that they have no luggage capacity, no mudguards, no chainguard, so they make a mess of your clothes, especially if it rains, the chain wears quickly due to being exposed to the elements, and they are not very practical bikes for everyday use. What's more, you must never let your feet fall off the pedals with a fixed wheel bike as this can lead to a loss of control and a crash. I always used clipless pedals and therefore had to wear dedicated shoes with my fixie. wider sizes don't roll badly either. On the other hand, the wonderful thing about Dutch everyday bicycles is that they're clean in use. Not only do you stay clean but the important parts of the bike stay clean too so they last longer. Dutch town bikes also have puncture proof tyres, a permanently mounted lock, dynamo lighting, and panniers or baskets to carry luggage (much better than having to carry an uncomfortable rucksack). These complete the picture of the perfect everyday use bicycle. What's more, you can of course wear anything when riding a Dutch style bike. I still use clipless pedals and special shoes on the bikes that I use for fast and long distance journeys, but they're not what I want for shorter journeys in town. My "near fixie" is in effect a hybrid these two ideas. Of course the bike isn't really a fixie at all because I've used a back-pedal brake rather than a true fixed wheel. However this gives the same efficiency as a real fixed wheel bike: the energy put into pushing the pedals goes directly to the rear wheel. The only difference is that coasting is possible and what happens when you want to slow down. Using a back-pedal brake brings the advantage that it's safe to use flat pedals and therefore I can wear any shoes that I want to. 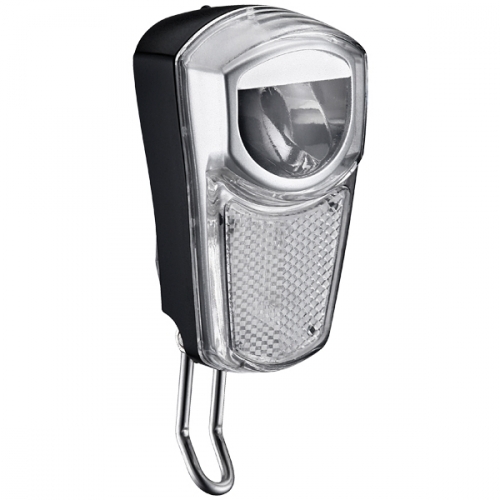 Because the chain is enclosed in a chaincase it does not get dirty and wear out so quickly as it would exposed. This helps efficiency because a dirty chain wastes a lot of energy. It also helps to keep me clean when riding. Mudguards are also required to keep me clean and dry. 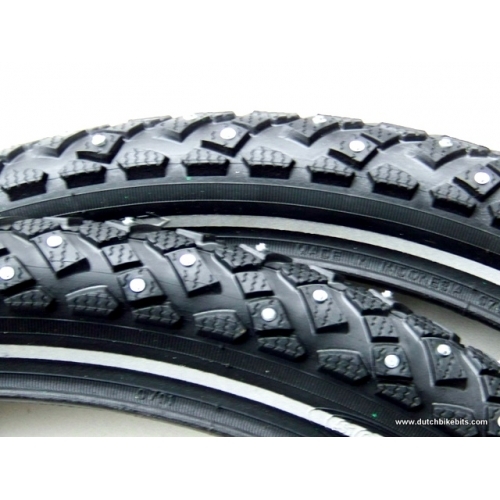 Reliable tyres which may not look "fast" actually have quite low rolling resistance when pumped up hard. 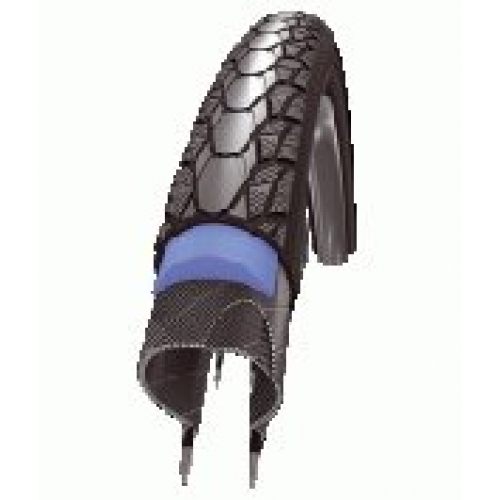 In any case they're infinitely faster than any other tyre with a puncture. 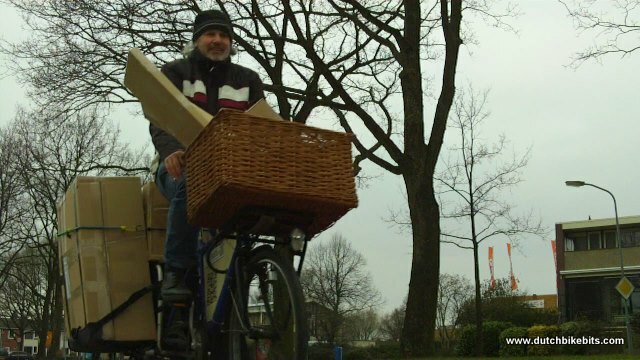 The end result is a very efficient and practical bike. It has all the practicality of any Dutch town bike combined with the efficiency of any bike on which the transmission has been stripped down to the basics. Of course I could have just asked the opinion of my daughters. They're amongst the millions of people who have been riding efficient bikes like this for many years. Or I could have looked back to my youth. 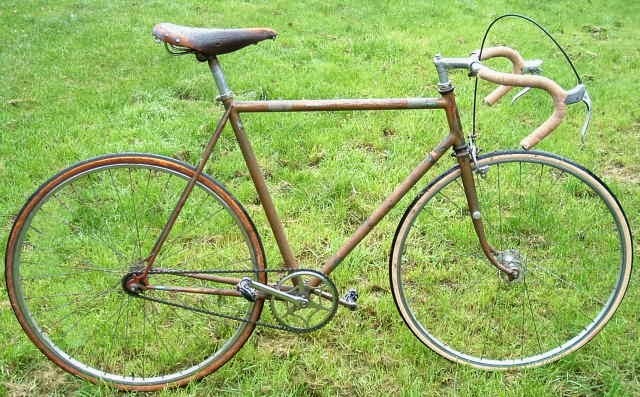 I had a single speed back-pedal bike as a child and I went everywhere on it. It's a myth that utility bikes are inherently inefficient and slow. They can be, but there is no reason for this to be case so long as the drive-chain is efficient, they are set up for the rider, they are well maintained, and the tyres are pumped up hard. A German website measured the efficiency of several different bicycle gearing options. The thin lines show 50 W through the different gears while thick lines show 200 W. These are roughly equivalent to average power outputs by people riding relatively slowly around town vs. those riding at speed through the countryside. All of the gearing options are less efficient at lower powers. However the single speed arrangement (pink - as I have on my town bike above) is highly efficient at all power inputs, while all other options are worse. A derailleur (orange shows chain tensioner) is the only multiple speed setup with consistently similar efficiency to single-speed, thought the Rohloff Speedhub comes commendably close and achieves slightly higher efficiency for one ratio. 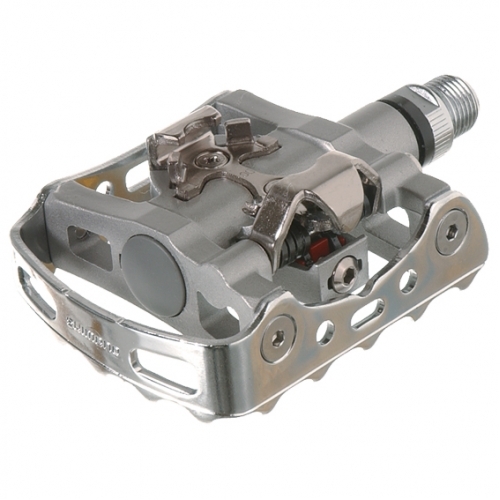 For practical use, derailleurs have the problem of being exposed to the weather, and this results in rapidly reducing efficiency due to fouling of the chain. The Shimano eight and 11 speed hubs and the the NuVinci continuously variable gear are also tested. Of these, the NuVinci is easily the least efficient tested. At best, with a strong rider, only 85% of the energy used to push the pedals makes it as far as the rear wheel and pushes the rider along. In some gearing ratios with less strong riders less than 80% of the energy that the rider uses to push on the pedals drives the bike along. The rest warms up the hub. I don't think that people with less strength benefit at all from having up to a quarter of their effort turned into warming the hub up rather than pushing them forwards. The other hub gears gain a little efficiency with a stronger rider, but the NuVinci does not. It's relentlessly inefficient at all ratios and for all riders. An awful component. A crime against cycling. Now we know why the company who makes these things has been so reluctant to release actual performance figures.